Are you searching for a creative way to convey your message to the masses? Our customizable and affordable flutter flags are the perfect way to grab the attention of passersby and draw them towards you. With different sizes and shapes available, you are sure to find a display that fits all of your advertising needs. Thousands of companies have found flutter flags to be a great way to promote specials, increase brand recognition, and display slogans in both outdoor and indoor settings. 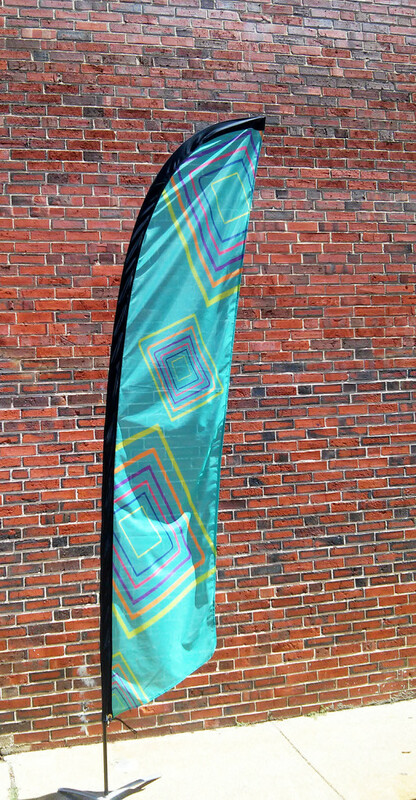 Ideal for fairs, retails stores, college campuses, and trade shows, our flutter flags are both user-friendly and portable. All of our flutter flags are printed on a lightweight, durable flag cloth and finished with a hand-stitched hem. The flexible, fiberglass poles allow the banner to rotate freely in the wind, assuring that your image is always visible. Packages also include a stainless steel ground spike and convenient carrying case. Cross bars and water bags are available to allow for indoor use.